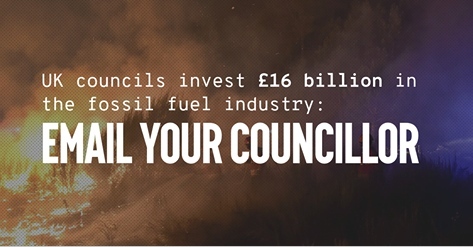 Local councils across the UK are investing £16 billion in the fossil fuel industry. That’s £16 billion of public money #fuellingthefire of the climate crisis, and propping up the fossil fuel companies responsible. It’s time for our councils to divest their pension funds from companies who are driving the climate crisis, and instead work for a transition to a just, renewable future. Email your councillors now and ask them to take action for divestment. This year has brought devastating climate impacts, with hurricanes ravaging the Caribbean, and Pacific islanders fighting to stop their homes from sinking into the sea. While national governments gather for the COP23 climate talks in Germany, our new report shows here at home, local councils are still backing the industry responsible for the climate crisis, pouring billions into the companies blocking action. Check out the map to see what your council invests in the companies fuelling climate change. Two years ago, world governments signed the Paris Agreement – pledging to limit global temperature rise to 1.5 degrees. But the actions of fossil fuel companies like Shell and BP are pushing us far beyond this vital climate threshold.